A couple of “knitted” fonts from Hand Made Font (am I the only one who finds a price of €70 for a font astonishing?). 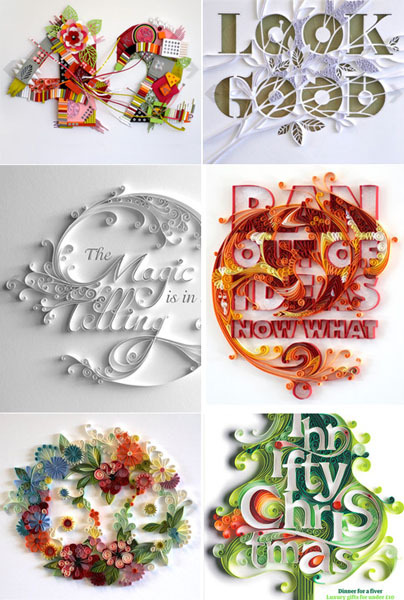 Gorgeous quilled artwork by Yulia Brodskaya via Craftzine. Like any lifelong crafter I have tried many crafts. Quilling is one of them. Somewhere in my disorganized house is a quilling needle or 3 and a pack of quilling paper strips (or 2), although I don’t think I actually have a quilling strip cutter (yet?). To my mind, quilling and Chinese knotting have a lot in common. They are both dimensional and flat-ish at the same time. Also, I love the swoops and curls of quilling and would love to incorporate them into my work. Perhaps with wire. stories or blog entries. what’s the difference?